F A B | Fountaindale Art Blog! We think this shows that it’s not just the students who are creative and can have fun! 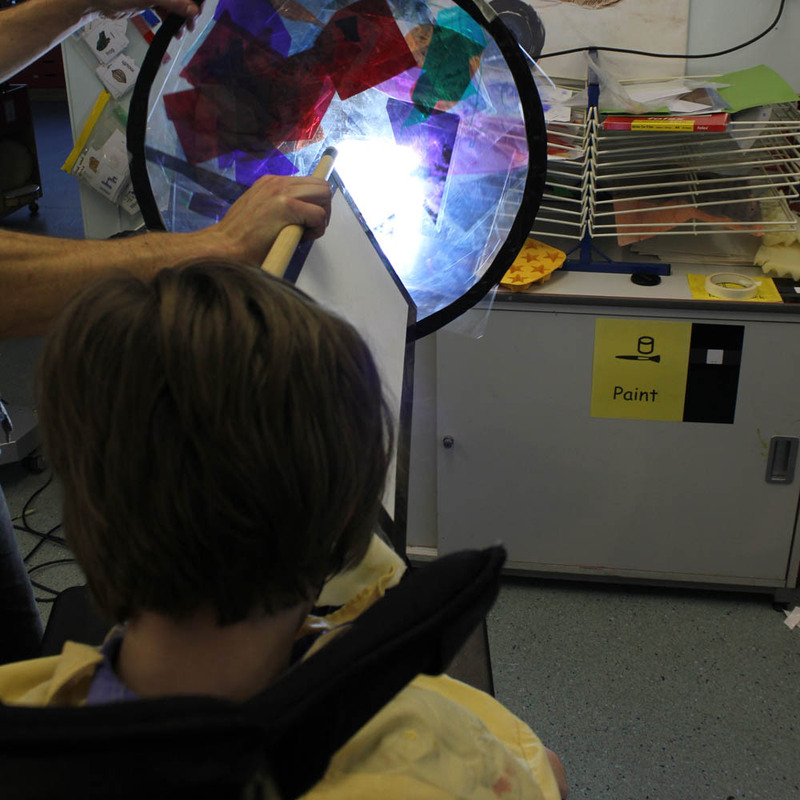 These photos and films were made during an Inset Day at Fountaindale School. Staff from Fountaindale and the surrounding specialist schools gathered to explore creativity. They spent time with Shirley Novak delving into the world of sound, and with us, experimenting with stop-motion animation and light writing using long-exposure photography. There’s so much more we could have done! A short film showing the ‘Weatherscope.’ The giant kaleidoscope was installed – and enjoyed – in school for two weeks. The students, proudly showed their creation off to their friends, other pupils, and staff. It got a great response – despite the infinite reflections making a few staff feel dizzy and sick, the overall response was one of a calm, mesmerised and captivated audience! In a darkened room this film can loop and play forever and ever, it’s projected into the back of the giant kaleidoscope, along with sound coming hidden speakers. The students we’ve been working with are inviting their friends, staff and other pupils in, to give tours and explain how it’s all been made. The penultimate session of our weather wonderings saw us thinking about the sounds that rain makes. The noises of wind in the treees, and snow falling. The crashing of thunder. We used instruments that we’d made oursevelves – simple rain stcks, tubes filled with nails and seeds and dried beans – as well as fabric, bells, pots and pans, cymbals, a xylophone, and whatever else we could lay hands on. As a group we decided on a simple ‘story’ for our film too, laying out in a new order all the work we’d done so far. Finally we photographed the ice lenses – frozen water mixed with glitter. Noticing that close up glitter is made of tiny hexagons, just like the reflections in our kaleidoscope. We hope everyone had a wonderful, peaceful Christmas break, we’re looking forward to being back in school and getting busy again. just before we get to the end of all the hard work, here’s a look back at just how intense it has been! Making art from leaves and cloth. Sunny spin paintings and object collages. Today we warmed ourselves in the autumn sun – hunting for colourful leaves to use in our artwork. Once back inside working one by one the leaves were put to good use, as textures on the firey surface of the sun (a round orange rug!). Keep checking back to see more soon. Making a giant Kaleidoscope helped us understand the beautiful symmetry of snowflakes, and have a lot of fun too! No one escaped without being photographed. It gave us lots of ideas for the future – we’ve all been trying to think about ways to share this work, imagine building something bigger and getting inside. The wind gusts into a full blown thunder storm this time! Crash, flash! Painting with lights in the darkest room we could find in the school, long exposure photographs are our lightening flashes. Meanwhile, dripping paint became storm clouds, and we made our very own storm in a teacup (well, a bucket). Dropping glitter, paint, sequins and rice into a swirling atmospheric soup. Thinking about the wind this week – how to make it visible, how to record it. Collecting natural objects, fans blowing, timelapse photography, clouds moving across the sky. We made a sculpture from an old wheelchair wheel and some coat hangers. Swirling like a tornado.